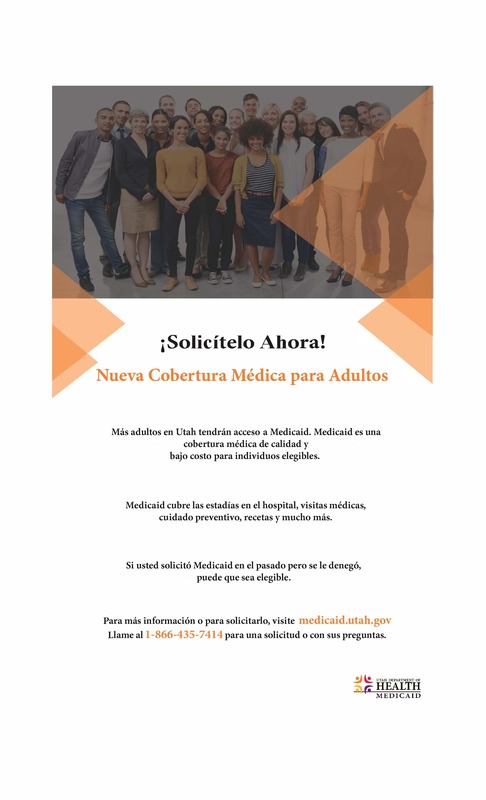 The Centers for Medicare and Medicaid Services (CMS) authorized the Utah Department of Health (UDOH) to expand its Medicaid program. This new waiver called the "Bridge Plan" allows the state to expand Medicaid benefits to parents and adults without dependent children earning up to 100% of the federal poverty level, about $12,492 for an individual or $25,752 for a family of four. 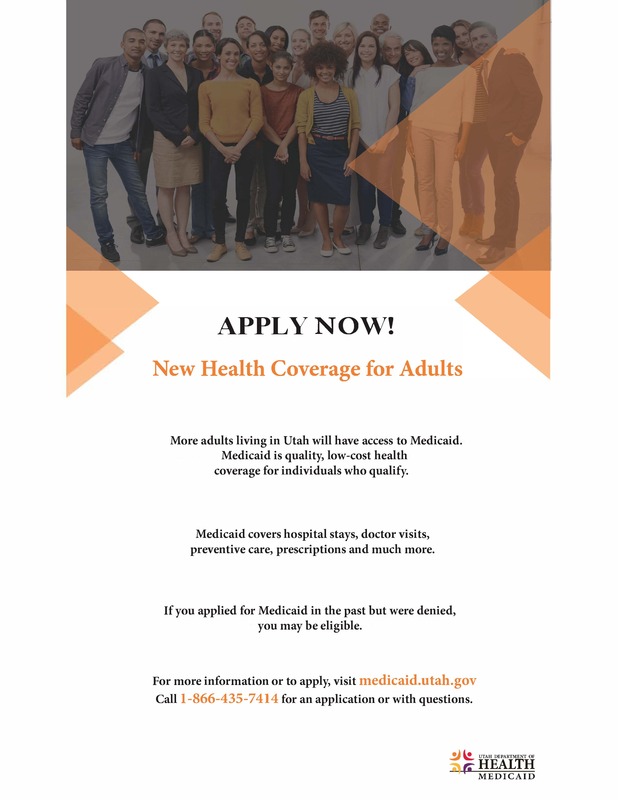 Beginning April 1, 2019, individuals may submit their applications to the Department of Workforce Services (DWS) to enroll in Medicaid Expansion. Submitting an application for benefits does not guarantee coverage. Individuals may also apply in person at a Department of Workforce Services office or by mail. Call 1-866-435-7414 for an application or with questions. It is anticipated that approximately 70,000-90,000 individuals will be eligible for this new program, in which the federal government will cover approximately 70% of the costs and the state will cover the remaining 30%. Approximately 40,000 individuals from 101-138% FPL will continue to receive services through the federal Marketplace. This spring, the State will also submit a new 1115 Waiver to CMS called the "Per Capita Cap Plan". This plan will replace the plan implemented on April 1, 2019 and will be effective upon CMS approval. The Per Capita Plan covers adults up to 100% FPL and requests the following provisions: self-sufficiency requirement, enrollment cap, up to 12-month continuous eligibility, employer-sponsored insurance enrollment, lock-out for intentional program violation provision, and a per capita cap. This plan will also request 90% federal/10% state funding. These plans are being implemented as directed by Senate Bill 96 (2019 Legislative Session). This bill supersedes previous Medicaid Expansion efforts and replaced Proposition 3 (2018 General Election). Details regarding both plans and SB 96 are available in the Medicaid Expansion: At-A-Glance Chart below.